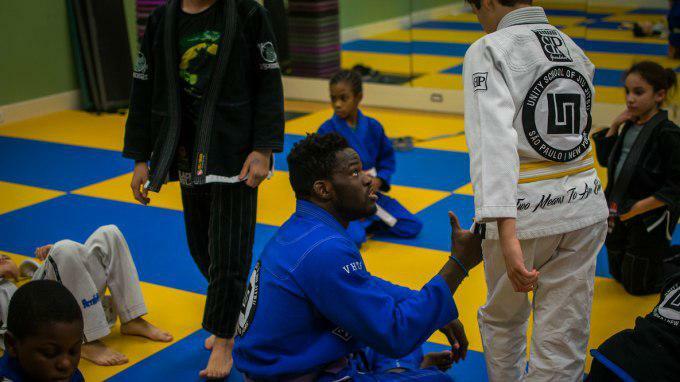 Most BJJ fans know Devhonte Johnson of Unity Jiu-Jitsu as one of the most promising brown belts in the sport. The New Jersey native won nearly everything throughout his purple belt days, culminating with a 2017 world title in the purple super-heavyweight division. Since receiving his brown belt from Murilo Santana, Johnson has been tearing through the circuit at brown belt, most recently winning No-Gi Worlds and Europeans. What fans might not know about Johnson is another side to his jiu-jitsu story, as he is cultivating one of the top kids’ teams in the world at his school in Totowa, New Jersey. Since opening his own academy at the Unity New Jersey location in February 2016, Devhonte’s students have turned in impressive performances at the biggest kids’ tournaments. In the first two years of taking the Unity kids to Pans, the team has sent 22 total kids and brought home 12 gold medals (five silver and five bronze).